A festival of candles and light has taken place in early February since ancient times, when women and girls used to walk in torchlit procession in celebration of Ceres, goddess of the harvest, and her daughter Proserpina. Legend has it that the daughter of Ceres (Roman Goddess of the harvest) was kidnapped and made his queen by Pluto, the King of the Underworld. Explore the story of this celebration and get some idea about how to enjoy the Carnevale Romano. Enjoy these great Roman legends: La Cenorientola, The Dark King, The Dead Man in the Oak-Tree, The Little Bird, St. Anthony (Five Tales), The Two Hunchbacked Brothers and Why Cats and Dogs Always Quarrel. 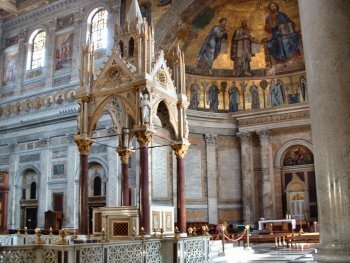 Rome too can be proud of a few mysterious presences, whose stories are tightly bound to the city's own history and traditions. This list includes Latin and Roman proverbs and sayings with the English translation. This is an introduction to understanding the Roman dialect.